Zia is the debut album by Alexi Musnitsky, a young pianist born in New Mexico and currently living in Paris. Having played piano since age four with a formal background in classical training, Alexi began composing his own music when he was eighteen. Produced by Will Ackerman along with Tom Eaton and Alexi Musnitsky, and recorded at Imaginary Road studios in Vermont, the album is named after the indigenous Zia tribe of New Mexico. Cellist Eugene Friesen is featured on several of the compositions, while Tom Eaton lends subtle percussion and bass to three of the seven tracks. “Zia” opens the album with gentle piano notes that eventually unfold into a romantic and graceful melody. “War of Love” follows next, which is perhaps my favorite piece on the album. Capturing the essence of memories and things held sacred to the heart, accompanying cello and subtle percussion lend a slightly poignant quality to this tender composition. Radiance exudes from “Sparkling Heart”; beginning in the upper register of the piano, the pace picks up about one-third of the way through the piece, expressively alternating between a hushed and hurried dynamic. “The Quest” is the album’s lengthiest piece at just over eight and a half minutes. A heartfelt composition featuring cello, bass and percussion, the melody flows like a river winding through mountains, peaceful one moment and powerful the next. A morning sunrise shines on “Light Will Lead the Way”; likewise joined by passionate cello and soft percussion, this inspirational piece instills a sense of hope and optimism. A brighter piano melody is carried on “Mile of Life”, which is contrasted by the lower solemn tone of its complementary cello. A setting sun gives way to moonlight on “Dreamcatcher”, the album’s final piece. Along with Eugene’s cello, Will Ackerman lends the soft sound of a Hopi drum to this composition, while Noah Wilding’s wordless vocals pass through towards the end like a gentle evening breeze. This review was originally posted on Journeyscapes Radio on 04/21/16. 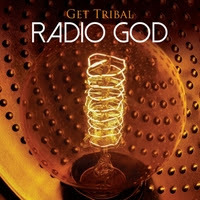 Radio God is Get Tribal’s follow-up to the award-nominated debut, God of Drum, a globally-inspired project by composer Kari Hohne. Drawing upon world mythologies and diverse cultures, as well as inspiration from music and films spanning several decades, she weaves these concepts into a blend of both ancient and modern rhythms within an electronic musical framework. “Guip: Sunrise” opens the album with vintage keyboard sounds and digital effects that are set to a pronounced and plodding electro-drumbeat. Percussion takes center stage on this album, where a retro-urban vibe is gilded with an exotic flare, taking the listener on a journey through modern city streets, ancient roads and desert landscapes. “Ruah: Breathe” continues in this vein while picking up the pace a few notches, as Middle-Eastern flavors additionally season this steady composition, further characterized by legato strings and a minor-key piano riff. “Taba: Out of the Underworld” perhaps marks the album’s most definitive point. Inspired by the Epic of Gilgamesh of ancient Sumerian mythology, the piece begins with a windy rumble and piano loop that resurfaces throughout the tune. Bearing a slight sense of forbiddance with its distinctive tribal drums, one might easily imagine a gathering of dancers in a remote desert by firelight. “Adon: Across the Sea” is also curiously noteworthy, drawing influence from the Pacific islands with its Hawaiian and surf guitar, as a whimsical harp sample offsets the funkier rooted rhythm. The celebratory “Ankh: Dancing Desert” is another highlight which offers a fun fusion of ancient, exotic, vintage and western elements. The composition’s blending of traditional Middle-Eastern Dervish dance music with 80’s-style electronic instruments is especially well-captured here. This album is available on Amazon, iTunes and CD Baby. Review originally published on Journeyscapes Radio on 04/16/16. 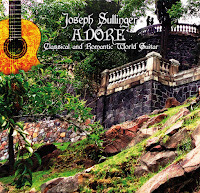 Adore is the sixth solo album from classical and world fusion guitarist Joseph Sullinger. He is joined throughout on various compositions by Hungarian violinist Adrienne Galfi (courtesy of the Mexico City Philharmonic Orchestra), as well as Eric Darken on percussion, and both Greg Morrow and Chris Mchugh on drums. 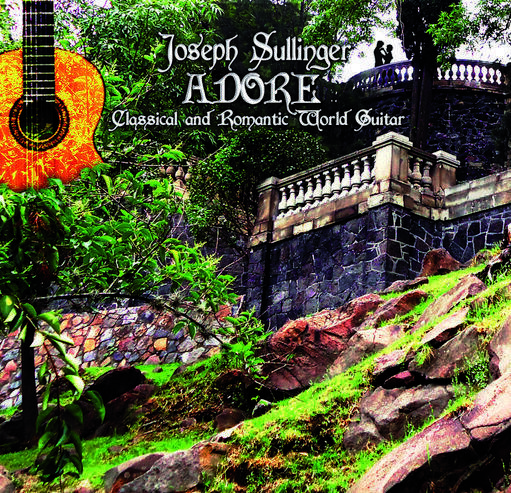 Comprised of nine compositions spanning nearly thirty minutes total, Joseph additionally fuses his classically romantic and Spanish style guitar melodies with piano, bass and synthesizer elements. For more information please visit the artist's website. This album is also available at CD Baby, Amazon and iTunes. Review originally published on Journeyscapes Radio on 04/02/16. Jeffrey Seeman picked up the guitar at the age of eight, having been influenced by a variety of musical styles growing up and playing in a few bands. His album, Everything In Between, was produced by Will Ackerman, co-produced, mixed and mastered by Tom Eaton, and recorded at Imaginary Road studios in Vermont. 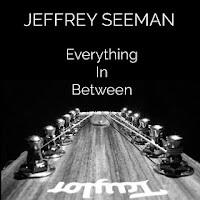 Jeffrey is joined on this album by a handful of musicians who lend instruments such as cello, violin, viola, saxophone, bass, percussion and Hammond organ to various compositions. The album opens with one of my favorite pieces, “5 Days Old”, which is guided by Jeff Haynes’ gentle percussion. It has a lush, multi-dimensional guitar sound that’s given added depth by Michael Manring’s bass guitar and Noah Wilding’s wordless ethereal vocals. 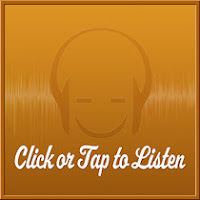 The mood livens up more on “Acadia Walk”, an upbeat tune with a strumming guitar melody and pronounced twang. The folksier “Michael’s Journey” is another highlight with a slightly Irish bent, led by guitar, a gently galloping rhythm and Charlie Bisharat on violin. Also noteworthy is “Ever Present Always”, a gentler and cozier tune with a homebody feel that features Eugene Friesen on cello. However, the most compelling and interesting track on the album is easily “Southern Night in the Woods”. A multi-faceted piece that begins with hushed nature sounds and guitar echo, its use of overdubs, slide guitar and bass all serve to create an enthralling surround-sound experience. Premik Russell Tubbs contributes his lively saxophone to a few of the compositions, including “Let’s Go” and the closing piece, “Point Well Taken”. Review originally published on Journeyscapes Radio on 04/01/16.